Brunelleschi designed several chapels in Florence, but my favorite is The Pazzi Chapel attached to the Santa Croce Church. In this small rectangular space, Brunelleschi created a well-balanced, elegant, and very appealing interior. The decorative pilasters, molding, and ceiling adornment clearly demonstrate Brunellschi’s understanding of classical Roman design and was huge architectural leap forward. Brunelleschi divides the Chapel into three stacked levels. On top, there is a beautiful ribbed dome. This sits on intermediate level consisting of four arches with decorated pendantives which support the dome and skillfully transition the round dome to the rectangular third, or ground level. Beautiful blue-grey Corinthian pilasters (or fake, purely decorative columns) are used to divide up each ground floor wall into vertical rectangular units. The chapel itself is 4 units deep by 6 units wide. Barrel vaults one “wall unit” in depth are used to connect the rectangular room to the square base of the domed roof. You can see the barrel vaults in these pictures because they are decorated with square frames and circular leaf elements. The two central rectangle units on each wall have been combined to accommodate the entrance in the front wall and a small altar on the back wall respectively. For a uniform design, the central pilaster on the side walls has also been removed (see the first photo above) creating smaller arches that mimic the one over the door and altar space. I absolutely love that the window frame molding as been repeated in all vertical wall units. This creates visual balance between all the walls and shows creativity in using a functional window molding as a decorative element. Additional adornment is kept to a minimum. 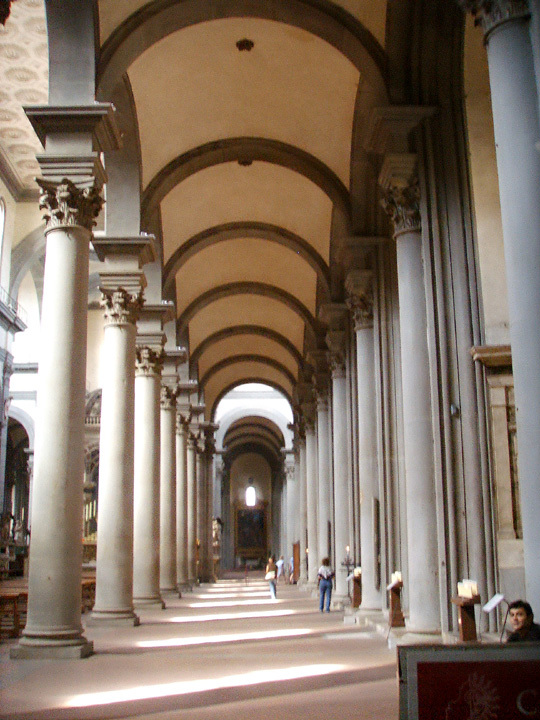 Like earlier commissions, Brunelleschi probably intended for the circles on the walls and pendantives supporting the dome to be undecorated. As you can see, these spaces were decorated with ceramics reliefs by Andrea della Robbia depicting the 12 apostles along the walls and the four Evangelists above. There are also small Seraphim and lamb tiles just below the arch level. I actually think this is perfect amount of color of the space. The apostle plaques respect Brunelleschi’s overall aesthetic of the blue-grey architectural elements set against a white background. If you’re looking for more Brunelleschian chapels, be sure to visit the Old Sacristy (Sagrestia Vecchia) in the Church of San Lorenzo. While the design is not as uniform and harmonious as the Pazzi Chapel, you can consider this an intermediate example and then appreciate his architectural progression and development. I find the Old Sacristy to be a little visually “cluttered” with sculptural plaques of saints – but then again, Donatello executed these stucco reliefs, so its really not that bad. Brunelleschi actually designed two churches in Florence which were both completed after his death; Santo Spirito remains truer to Brulleschi’s vision for the church. The building is organized in a Latin Cross lay-out with a long nave and shorter transcept. The interior quickly defines the fundamental sub-unit of the church: two Corinthian columns connected with a semicircular arch. Using this unit, the side chapels are 1 x 1, the central aisles are 2 units wide, and the church itself is 8 units wide and 14 units long. The consistency of this single unit throughout the church is visually very beautiful. You can really see the rhythm of the columns and mathematical rigor in the church design. Santo Spirito is a wonderful example of Renaissance architecture. 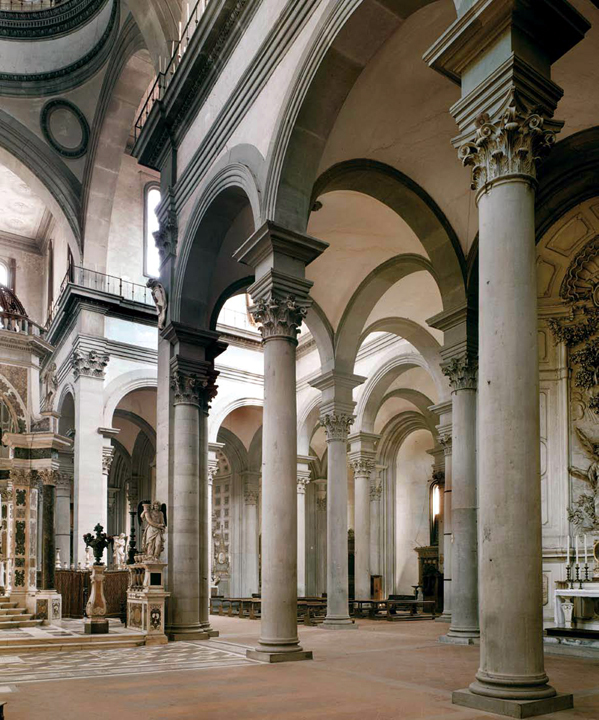 Like in the Pazzi Chapel, blue-grey molding stands out against the white and stone interior. 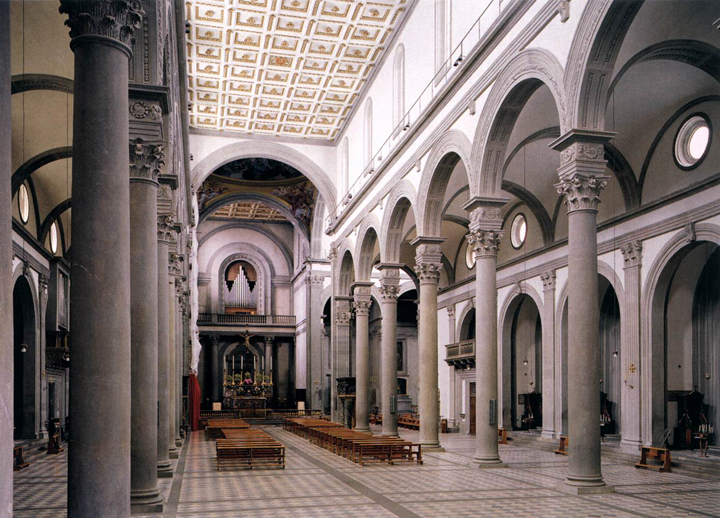 Brunelleschi’s other church, San Lorenzo was altered to make it more of a “T”-shaped lay-out. The overall effect is muted because you don’t get the same sight lights as Santo Spirito, but you can still see the use of repeating architectural elements along the naive of the church. I really like the use of plain columns and fluted pilasters along the side chapels. The mix of these vertical elements contrasts nicely and is just as visually appealing as the single repeated column element in Santo Spirito. What biographical information we have about Brunelleschi paints him as a shrewd, confident, and self-reliant man. This boldness supports his legacy foremost as an engineer and builder that shocked the world. However for me, Brunelleshi is an artist. He created some of the most beautiful and serene religious spaces I have ever experienced. His refinement and re-interpretation of classical architectural motifs became the template for all Renaissance builders. When summing up his many achievements and contributions to Florence, we must always remember the harmony and order of his churches and chapels, as well as the effortless height of his dome. I love this. 🙂 Santo Spirito is one of my favorite places in Florence, and I also find the Pazzi Chapel to be so special. I really enjoyed revisiting these churches through your post, Christina. The Pazzi Chapel is so stately and beautiful inside. Della Robbia blue and grey stone are truly the colours of Florence. Serene stone, indeed. When I visited Florence, the only Brunelleschi building I was able to visit was the Duomo. I just love the clean, organized appearance of his work – will definitely be checking out the Pazzi Chapel the next time I get a chance to visit. What a fantastic tribute to Brunelleschi Christina! I really enjoyed how you explained all of elements accompanied by gorgeous photography to illustrate his designs! A most superb write up that I believe Brunelleschi himself would be proud of! Is there a book on brunellesci? I’ve not found one. “Brunelleschi’s Dome: How a Renaissance Genius Reinvented Architecture” by Ross King is a great introduction. Eugenio Battisti wrote the definitive biography if you are looking for more depth. Enjoy!